It can be difficult for an individual to know their desire about parenthood, understand how that desire evolved, and then make a decision about what path they will take. Putting two people on that journey can make it doubly difficult, especially when the people feel they're heading in opposite directions. Below is an exercise I offer to clients who feel they're in a stalemate over their parenthood decision. Ideally, one of the two have read Motherhood-Is It For Me? 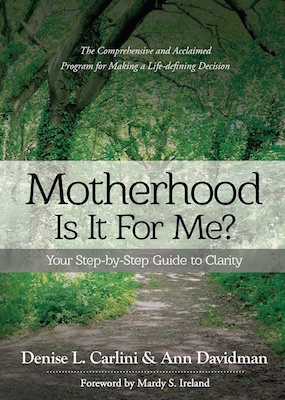 Your Step-by-Step Guide to Clarity or taken my Motherhood Clarity Course™ or the Fatherhood Clarity Course™ so that one of them is clear on their desire. Regardless of their previous experience, this exercise encourages partners to be open to each other. Even if you already have a sense of what you’d like your decision to be, take a step back to a place of being open to your position changing. Let yourself relax into not being so sure. 1) On your own, each of you think about what you want and why. Do this for yourself not because you need to defend your position but so that you can know yourself and be honest with yourself. This will take as long as it takes but you can’t move forward until each of you is honest with yourself about what you want and why you want it. Having a conversation without clarity of desire will be a waste of your time and will keep the conversation looping. Once both of you can articulate what you want and why then share that with each other using the instructions in the next step. Set a timer for 10 minutes and have one person go first and talk about what you want and why and what it means to you. Share your hopes and dreams and make it about you. Keep in mind that you are not making a presentation to sell. You are asking your partner to hold space for your vulnerability. You are inviting them into your heart and expecting them to be caring and respectful of you. During this 10 minutes only one person is talking. The sharer gets the entire 10 minutes without interruption and without questions. If you feel like you are finished before the 10 minutes is up, then sit in silence until the end your time. If it’s your turn to listen, then look lovingly and interested at your partner. If there is silence let the silence be there. You as the listener might have questions but save them for now. Then switch roles. If it’s your turn to talk, this is not the time to comment on anything the previous person just said. Make sure each person gets a turn before either of you asks any questions. 3) Now you each get 5 minutes to recap or make additions. At this point, there is still no asking questions of each other. 4) Then ask each other, “Is there anything that I said that you don’t fully understand and want to understand better? If so what is it?” Give yourself as much time as you need with this step. This process is supposed to feel good. If you find you’re feeling defensive or getting upset then take a break. Or set the timer for 5 min. each so that you can talk about what’s coming up for you or what you’re feeling. Remember that when you’re using the timer only one person is talking and the other person is listening. Then go back and forth until you both can answer yes to that question. 6) Immediately after, do the following writing assignment. When you’ve completed your writing, read your answers out loud to each other. 7) Let all of this settle for a few days and notice your own personal feelings that are surfacing and give yourself space to feel all your feelings without judgment. 8) You’ve now set the stage to have a discussion that involves sharing what you’d like the decision to be, which could include conditions. This is the time to ask questions and maybe challenge each other’s beliefs but not from a judgmental place. Need help discovering your desire about parenthood? Let Motherhood - Is It For Me? Your Step-by-Step Guide to Parenting be your guide. As a woman who has success and fulfillment in most areas of life, it was hard for me to admit that this decision was ripping me apart inside... I needed help; as it turns out, this book and Denise and Ann's program helped me in much bigger ways than I could have imagined.... I can now own what I want. I will attest to the fact that there is no "agenda" in this book. For those concerned of bias in one direction or another about your decision to be a parent, put that reservation aside. I could not recommend this book more highly.